RB To me, something beautiful should excite an emotion, as though it switches something on in you. I’ve always been a plane fanatic and I was lucky enough to fly on Concorde a few times. When it takes off, it literally makes me cry, I have that much of a reaction to it. And I also think it has the most exquisite shape. There’s not a square centimeter of it that isn’t perfection. More than that, it’s not just a beautiful object, it’s a perfect marriage of functionality and design that can’t be improved on. I did consider a painting, a couple of couture Charles James dresses that are beyond gorgeous. The construction of those and the way they’re engineered is also fascinating but my gut was to go with Concorde so I went with that. GB When did you fly on it? RB I was living in New York in the mid 90s. Right after Franco Moschino died, Moschino asked me to consult with them again. I’d started my own line in New York and I was so busy with that, so I said I didn’t care how much they paid me, but I could save an entire day of travel if I could fly on Concorde. So for a year I went backwards and forwards at least once a month between Paris and New York that way. It was absurdly glamorous, even though it was tiny inside and I couldn’t even stand up in the bathrooms. It was very smooth. Occasionally it was a little scary. GB Can you remember when it was first invented? RB It was 1969. It’s incredible when you think back to how prehistoric the rest of technology was then and yet this thing got built. I don’t think it was ever fully appreciated. It’s such a shame that the USA banned it from flying across the country because of the sonic boom it made. That’s why it was never able to make commercial sense. They were only allowed to fly over oceans. GB So if there is a Russian oligarch building his own supersonic private jet right now, he probably won’t be able to fly to many places in it. RB Probably. It is such a tragic beauty now, especially after the crash. That last flight to London was a very sad day in my life. Soon after that, they started shipping the intact ones to various museums around the world. I was living on 45th Street quite near the river when the Intrepid Museum got one. They towed it down the river on a big barge and I watched them put it in place. GB Did the design never look a bit weird to you with the droop nose? RB They had to invent the hydraulics to life the nose up and down because they just couldn’t see down to take off and land. GB So is the power and the technology of it what’s beautiful, or the way it looks? RB It’s both. I’d say it’s 60:40 the way it looks and then the technology. GB And the smug satisfaction of having been on it..! Does it relate in any way to the beauty you find in art? RB I think it’s subtly different. Apart from the fact that when I see anything I find beautiful, my heart skips a beat. You see and feel something differently. There was a Turner exhibition at the Met a few years ago and I was standing in front of some of those paintings blabbing, those later works that were abstracts before their time. I couldn’t categorize exactly what it is that provokes that response. Sometimes it’s the way my dog lies when she’s asleep. GB You’ve spent your life in fashion and art so beauty must be a big part of your life? RB Yes, huge. I’m a completely visual person. Whatever beauty is to me, it’s something I strive towards. GB You don’t mind the word beauty in connection with art? It doesn’t trivialize it? RB No, it does seem as though it’s an un-PC concept these days but to me, it’s what it’s all about. GB Is Concorde universally beautiful? RB I can’t imagine that everyone will love it as I do but it’s such an archetypal shape. It encapsulates a moment in the 60s when commercial considerations seemed less overpoweringly important than they do today. It’s sad that the spirit of adventure to try something that had never been done before seems to have gone, like in the movies where it’s just sequel after sequel. You can question spending tax-payers money on something like Concorde. Wealth inequality has shifted a lot since then so maybe it’s understandable, unfortunately. It was a time when anything seemed possible. Do you remember that the Russians had their own version? 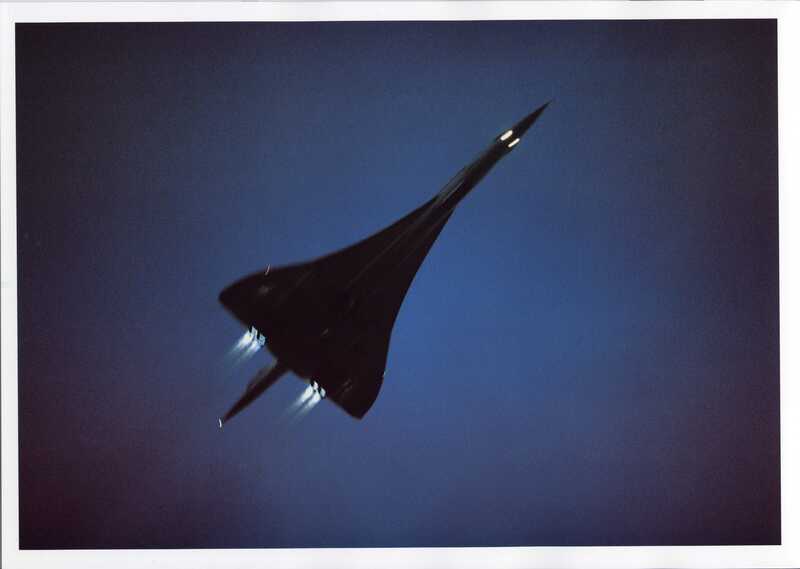 They stole the plans somehow and built the Tupolev-144, or Concordski to us. It didn’t work though. They took it to the Paris air show and it didn’t work. RB It’s such a personal reaction. It’s entirely subjective. The only thing that makes something worthy is the reaction you feel in yourself. There are things that most people would agree are beautiful, like the Mona Lisa, but then a lot of that is a cultural reaction because people think they ought to find something beautiful rather than really appreciating it. When you have a connection with something you find beautiful it totally warps time. It transcends everything.